Backed by vast experience in this domain, we have been able to manufacture, supply and export a comprehensive array of premium quality Brass Gas Fittings. These fittings are manufactured by our engineers employing highly advanced cutting & lathe machines in conformation with highest benchmarks of quality. In addition to this, we customize offered range as per their detailed technical specifications. 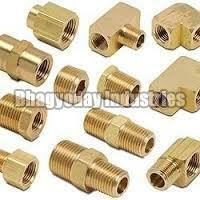 Our patrons can avail these Brass Gas Fittings from us at market leading prices.